Have a special event you want to target the locals for? Have a special sale just for the ladies or gentlemen? Or how about a certain age group you want to target? You can target your post to only these audiences by using the News Feed Audience Selector. People respond so much better to post when they feel like it’s speaking right to them. So when you’re thinking about what you’re going to share with your fans why not think about targeting a specific audience and speak right to them? 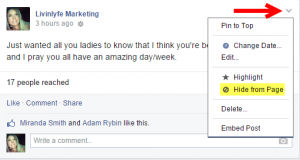 We need to make sure you have your settings turned on so that you can target a post to a specific audience. Head over to your page Settings, making sure that you are under General Settings you’re going to see Targeting and Privacy for Posts. 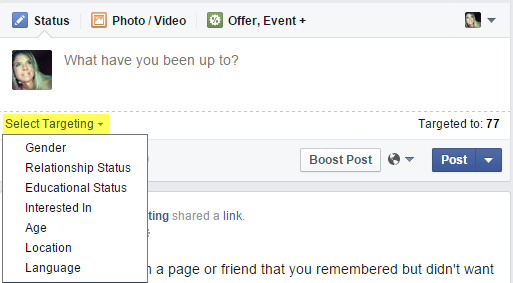 If this says that post are turned on for my Page then you are golden and don’t have to edit it. 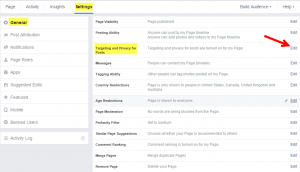 However, if it says that targeting and privacy for posts are turned off for my page then hit the edit button and click this box to add a check mark… now you are set for targeting specific groups of people with your post. Head to your page and let’s target a post so the audience you target are more likely to see it in their News Feed. Keep in mind that when you are targeting a post you are only targeting the fans of your Business page. This is not an ad this is a post that is going out to YOUR Fans. Heads up…the minimum number of people you can target your post to is 20 so make sure that whatever audience you are targeting has at least 20 within it. Take a few minutes and play with the different audiences you can target. To remove any of these audiences you can simply remove them by mousing over the option and click remove. I also want to point out that even though your post may only go out to that targeted audience, anyone that comes to your Business page will see that post on the timeline so if you want to make it where it’s not visible then Hide that post from the page. What are some ways that you are thinking about using the targeting post? I’d love to hear all about it in the comments below.